Image size: 20 1/2" x 27"
Redemption: [noun] liberation, deliverance, free; set free, set clear, set at liberty; render free, emancipate, release; discharge, let go, let loose, let slip, deliver. Make no mistake about it. The AH-64D Apache Longbow is the most lethal, deployable, survivable, and maintainable multi-mission helicopter in the world. 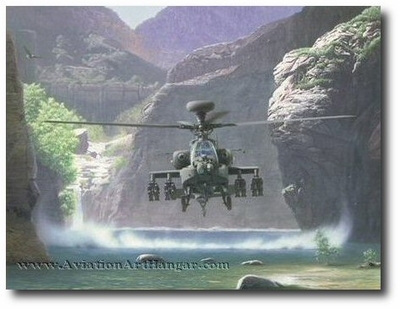 Operating at close quarters in a river canyon, the Longbow Apache demonstrates its improved performance and handling characteristics over its predecessor, the AH-64A. With its advanced FCR system, which can track and store up to 256 different targets, the Apache Longbow is 28 times more capable than the battle-proven AH-64A Apache, for years considered to be the world's best combat helicopter. There are two elements that are hidden in this painting: an animal (no, not the eagle), and the profile of an Apache Indian's face. The face is visible at this resolution. The hidden animal might be more difficult to spot. 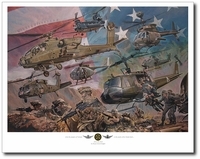 Reproduced in exacting detail on 100lb Museum Quality Archival stock, each lithograph is individually signed by the artist, Dru Blair. "Redemption- synonymous with liberation and deliverance, hints at the Longbow Apache's capacity to restore freedom, or to rescue those in peril."